File Renamer will let you rename all your files and folders, but with a lot more options. 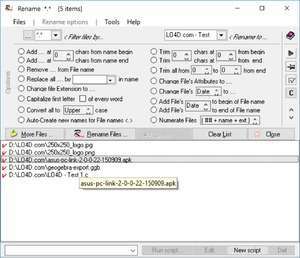 Can batch rename files, add or remove strings to filenames, change file extensions, numerate filenames sequentially, convert to uppercase or lowercase, trim characters, replace strings, and some more.. Works with multiple directories, suports Drag and Drop and works from the command line. Also has 'undo' function for past renames done. Version 1.2.4.3 is a freeware program which does not have restrictions and it's free so it doesn't cost anything. For security reasons, you should also check out the File Renamer download at LO4D.com which includes virus and malware tests. Additional screenshots of this application download may be available, too. File Renamer has a presence on social networks.